Spot a missing sector in your apartment? Just install a mirror to reflect and grow it back! Ludicrous it may sound but this is what some practitioners may suggest. Frankly, I do not know the effect of this technique because my landlord and building authority will not approve my submission to replace part of the external wall with mirror. What about protruding sector at home? Like this house at Bukit Panjang flat. Without flashing out your Luo Pan, can you tell what problem is the occupant(s) suffering from? And who in the house suffers? Fret not. With a good understanding of Early Heaven and Later Heaven Trigrams and 5 Elements, you can answer the questions above-asked. The same applies to missing sector. The full technique is to be taught in upcoming Xuan Kong Feng Shui course. Pardon me for doing a little advertisement here. As a gesture of goodwill, I will reveal a bit of the technique. This flat belongs to a client of mine who have stayed there for 7 years. 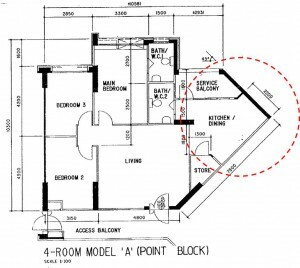 From one look on the floor plan, you would realise that the west sector of the house has a protrusion in the shape of a triangle. I told the father that this house would subject the occupants to issue relating to limbs and endocrine system that result in chronic disease like high cholesterol, trigylcerides and even diabetes. The father admitted that 2nd year after moving into the house, he had an operation on the leg. But the more shocking event happened 2 years ago when the son, who is now 15 years old, was diagnosed with Type 1 diabetes. In this instance, the body could not produce enough insulin to deal with the sugar intake. He has to jab himself with insulin on a daily basis. The questions that you should ask next is why affect only the son? Why did it happen only 2 years ago? The strange thing is that this health problem does not run in the family. From the Xuan Kong Feng Shui’s perspective, the protruding sector has upset the balance of the 5 elements in the house, causing the metal qi to be overly strong. When metal is too strong, it counters the wood element. Wood talks about limbs, liver, endocrine system and many other things. To narrow down to who in the family gets it, we have to relate the sector to a trigram which is in turn connected to the Life Gua of the person. This is one dimension. More techniques will be covered in the class.